utapatshimaushu – he/she pulls a child on a toboggan. (Lynn Drapeu. 1991. Dictionnaire Montagnais-Français. Montréal: Presses de l’Université du Québec. p.879). Tools used to make the toboggan included a hacksaw, pocket knife, crooked knife (mukutan), extremely sharp axe, small hand plane, pot for hot water, “brush” (split stick with old rag in end), holding wedge tool, a flat carpenter’s pencil, screw-driver-push drill, and a “needle” made out of twisted snare wire. Looks like quite a hard job, but summer can be so boring for snow addicts! And actually, it does kill, as it shows one of the most shocking campaigns. To keep the post on topic I will include here only the information related with polar tribes, but please, go and check the full campaign as it deserves all your attention. Forcing ‘development’ or ‘progress’ on tribal people does not make them happier or healthier. In fact, the effects are disastrous. The most important factor by far for tribal peoples’ well-being is whether their land rights are respected. 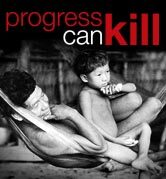 Some of the problems affecting tribal peoples are HIV/AIDS, starvation, obesity, suicide or addiction. The last three specially affect the indigenous people living around the polar circle. Tribal peoples without land are forced into a sedentary life and many become dependent on processed foods. This change in lifestyle and diet – from high-protein to high-fat food – is often disastrous, leading to obesity, high blood pressure and diabetes. In the Pima reservation (Arizona), more than half of Indians over the age of 35 have diabetes; while those living in the mountains suffer far less from this condition. The International Diabetes Federation predicts that excess weight and diabetes will lead to ‘earlier deaths and disabilities’. If untreated or detected late – as is common with tribal peoples – diabetes can lead to blindness, kidney failure, strokes, heart disease and amputations. The impact on future generations will be catastrophic. Dispossessed and alienated tribal peoples often take to drugs, usually the cheapest and most easily available such as alcohol and petrol. The health of individuals and families collapses. Babies are born with foetal alcohol syndrome, children get little care from addict parents, teenagers follow suit, and once-respected elders are alienated from younger generations. Cycles are fixed which cannot be broken by merely treating individuals or symptoms. The entire society falls apart. Tribal people across the world suffer from the trauma of forced relocation and settlement. They find themselves in an environment they are not used to, where there is nothing useful to do, and where they are treated with racist disdain by their new neighbours. Their children may be taken to boarding schools which separate them from their communities and often forbid or ridicule their language and traditions. Alienated and without hope, many take to drugs and alcohol. Domestic violence and sexual abuse soar. Many resort to suicide. In Canada, Indian groups who have lost their connection to their land have suicide rates up to ten times the national average; those with strong links often see no suicides at all. I think that the words speak for themselves. If you want to learn more about it, you can take a look at the whole campaign and also read the full report. Concerning Innu’s land, in 1869, Newfoundland decided in an election to remain a British territory, over concerns that central Canada would dominate taxation and economic policy. In 1907, Newfoundland and Labrador acquired dominion status. However, in 1933, the government of Newfoundland fell and during World War II, Canada took charge of Newfoundland’s defence. Following World War II, Newfoundland’s status was in question. In a narrow majority, the citizens of Newfoundland and Labrador voted for confederation in a 1948 referendum. On March 31, 1949, Newfoundland and Labrador became Canada’s tenth and final province. Geographically, the province consists of the island of Newfoundland and the mainland Labrador, on Canada’s Atlantic coast. While the name “Newfoundland” is derived from English as “New Found Land” (a translation from the Latin Terra Nova), Labrador comes from the Portuguese lavrador, a title meaning “landholder” held by Portuguese explorer of the region, João Fernandes Lavrador. As of October, 2007, the province’s population is estimated to be 507,475. 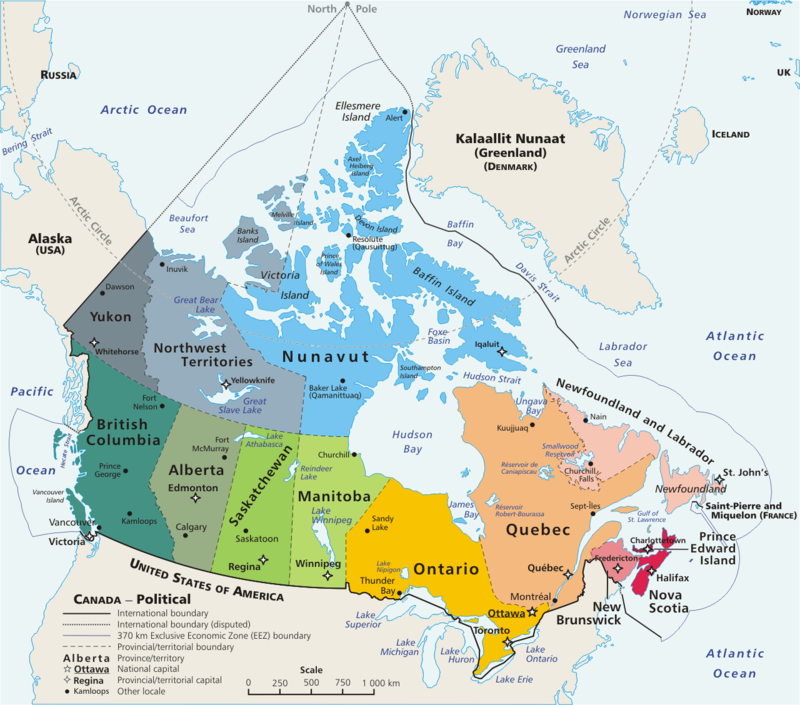 Newfoundland has its own dialects of the English, French, and Irish languages. The English dialect in Labrador shares much with that of Newfoundland. Furthermore, Labrador has its own dialects of Innu-aimun and Inuktitut. I seems that my research keeps going on, as usually thanks to the Internet. Looking here and there, I have found a website where Innu people speak about their language, which they call Innu-aimun. In that site they teach it, they have some traditional tales, some links, and also some interesting maps with the placement of their villages. I don’t know if they are different communities, or what. I will have to look for more information. For example, this article where they have a map created with Google Earth which a layer that shows all their villages in Canada. After deciding to take charge of this personal project, I soon realized that it would be unfair to do it without taking into account the whole situation of indigenous Arctic people. As I has sensed, I soon confirmed that they have to face heavy adversities to maintain this way of life, and I would consider it a lack of responsibility not to write about it. As I learned from my last entry, there is a NGO, Survival International, who works supporting tribal people worldwide. They have an excellent website, packed with tones of information. I will tell you what they say about the Arctic people, and then it is up to you to continue learning from them. The Innu are the indigenous people of most of the Labrador-Quebec peninsula, in eastern Canada. They were formerly referred to as the Montagnais-Naskapi Indians, and are unrelated to the Inuit (or ‘Eskimo’) who live further north. How do they live? Their homeland, where they have lived for millennia, is a vast area of sub-arctic spruce and fir forest, lakes, rivers and rocky ‘barrens’. They call this land Nitassinan. Up until the second half of the 20th century, the Innu lived as nomadic hunters. For most of the year, the waterways of Nitassinan are frozen, and they would travel in small groups of two or three families on snowshoes, pulling toboggans. When the ice melted, they would travel by canoe to the coast or a large inland lake to fish, trade, and meet friends and relatives. They hunt animals including bear, beaver and porcupine, and also fish and gather berries – but most of all they rely on the herds of caribou which migrate through their land every spring and autumn. Until recently, the Innu got all that they needed – food, clothing, shelter, tools and weapons – from the caribou, which have a huge cultural significance. Today the Innu have been settled into villages; although many hunt, fish and gather, some have paid jobs as well, or depend on social security. What problems do they face? 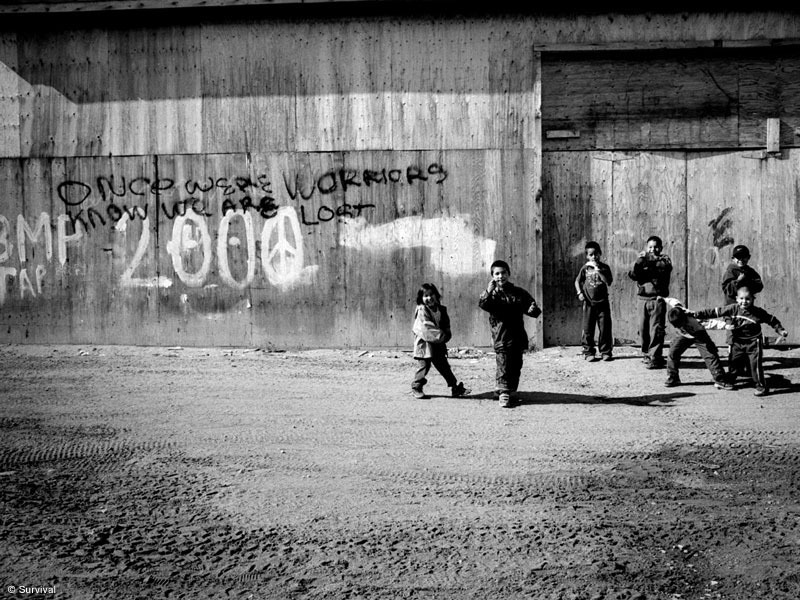 During the 1950s and 1960s, the nomadic Innu were pressured into settling in fixed communities by the Canadian government and Catholic church. The transition was difficult and traumatic. Life in the communities is marked by extremely high levels of alcoholism, petrol-sniffing amongst children, violence, and record levels of suicides. Many of the Innu are still fighting to retain much of their traditional lifestyle, increasingly difficult as the government hands out their land in mining concessions, floods the heart of their territory for hydro power schemes, and builds roads which cut up the remainder. In April 1999, the UN Human Rights Committee described the situation of tribal peoples as ‘the most pressing issue facing Canadians’, and condemned Canada for ‘extinguishing’ aboriginal peoples’ rights. How does Survival help? Survival is calling on the Canadian government to rethink its approach to negotiations with the Innu and other similar groups – currently they will only recognise Innu land rights if the Innu agree to surrender most of their land. Canada must recognise the Innu’s right to own their land, and live on it as they choose.